Symphony Nova Scotia’s “Adopt-a-Musician” program wraps up another successful season with the annual “We Are the Stars!” concert on Wednesday, April 1 at 7:00 pm at the Paul O’Regan Hall in the Halifax Central Library. This unique musical program pairs professional musicians from Symphony Nova Scotia with groups of students from local schools in multi-session creative projects. Over the duration of this annual program, a symphony musician makes several visits to the school classroom to work with students and teachers on a special collaborative and original musical composition. All participating schools then come together to present their unique compositions in a non-competitive environment for their family and friends. 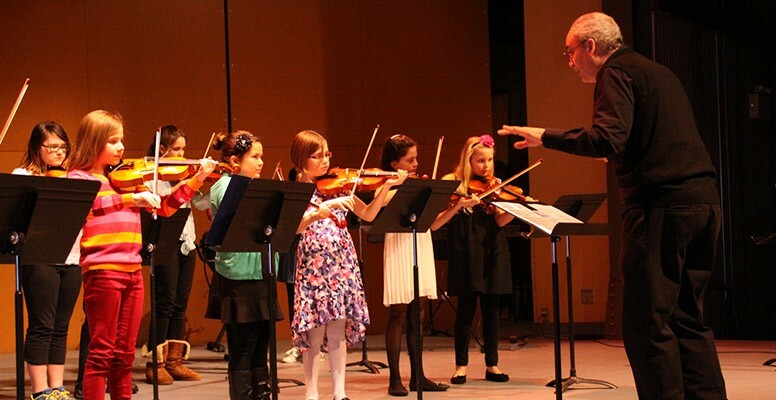 “The Adopt-a-Musician program is a wonderful opportunity for both children and musicians to forge vital links between our symphony and our schools,” says Symphony Nova Scotia Education and Outreach Coordinator Allan Gaskin, who has also experienced this program from the schools’ side as a teacher and principal. The “We Are the Stars!” concert runs about one hour in length and is free and open to the public. It will include performances from each of this year’s participating schools: Grosvenor Wentworth Park Elementary, Halifax West High School, St. Catherine’s Elementary, and Westmount Elementary. For more information about the Adopt-a-Musician program and Symphony Nova Scotia’s other Education and Outreach programs, visit www.symphonynovascotia.ca/education. Directly supported by: the Robert Pope Foundation, the John and Judy Bragg Foundation, and National Bank’s One for Youth Program.